Phoebe Pope has enrolled at the Campus Below: a spy academy for shape-shifters hidden deep beneath a normal boarding school whose humans unknowingly protect it. There, she leads a double life: spy trainee Below and normal teen Above. When officials discover a kill list, with her name on it, Phoebe's life takes a terrifying turn. For years, Phoebe has managed to keep her growing power a secret, but with villains hot on her trail, it's only a matter of time before she's exposed for what she is--a weapon. Phoebe seeks distraction in movie star Colten Chase, who attends the Campus Above and appears to be majoring in winning her heart. But desire turns to heartache when Phoebe suspects that something sinister lurks beneath Colten's glitter and fame. Now Phoebe's caught in a mesh of lies, betrayals, and danger. Can she rely on her new spy instincts--and her secret power--to get to the truth and to stay alive? 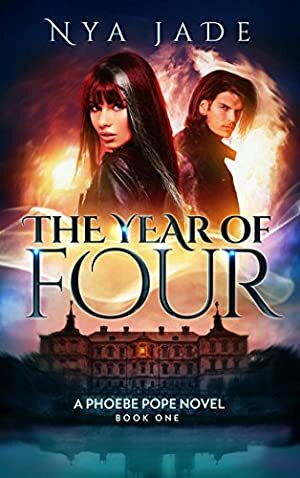 Captivating and unputdownable, The Year of Four is a magical Teen / Young Adult thrill ride you don't want to miss. Buy now and begin the adventure... Perfect for fans of Vampire Academy, Harry Potter, and The Mortal Instruments. Log In to track Nya Jade on eReaderIQ. to be notified each time the price drops on any book by Nya Jade. to stop tracking Nya Jade. The price of this book has changed 20 times in the past 2,319 days. The current price of this book is $1.99 last checked one day ago. The lowest price to date was FREE last reached on November 12, 2018. The highest price to date was $4.99 last reached on November 26, 2016. We last verified the price of this book about one day ago. At that time, the price was $1.99. This price is subject to change. The price displayed on the Amazon.com website at the time of purchase is the price you will pay for this book. Please confirm the price before making any purchases.